This is my story about the hardest trek I’ve ever conquered – the Colca Canyon Trek. I’m not much of a trekker but somehow I find myself doing a lot of it during my travels around the world, especially in South America. If you are not that fit and wonder if you can do it. The answer is yes, but this is how it’s likely gonna happen. After spending too much time in La Paz (and Bolivia in general), it’s time to move on. I randomly ran into the girls I met in Medellin, Colombia (Morin & Chantal) in La Paz. We decided to travel together because we’re going the same direction. I have to mention that La Paz is the likeliest place you’d ran into people again during a long trip in South America. It’s cheap for food, party, alcohol, drugs and shopping. I’ve re-met few other travelers. We took the bus to Copacabana (Bolivia, not Brazil), spent one night to visit Lake Titi-kaka and Isla del Sol and then again a night bus to Arequipa. The border crossing procedure is quite easy. About 10 minutes from Copacabana center, you arrive to the border where you get exit stamp from Bolivia then walk the 200 meters of no man’s land to where you get entry stamp Peru. You can exchange your remaining Bolivianos at either ends. Arequipa is quite a breath of fresh air from Bolivia. It’s touristy, but then I’m a tourist and following the tourist route. People are nice and the city looks bright with beautiful parks, lovely white buildings, and magnificent snow mountain backdrop. There were plenty of restaurants and cafes and here starts my eating quest with the Gougain sisters. 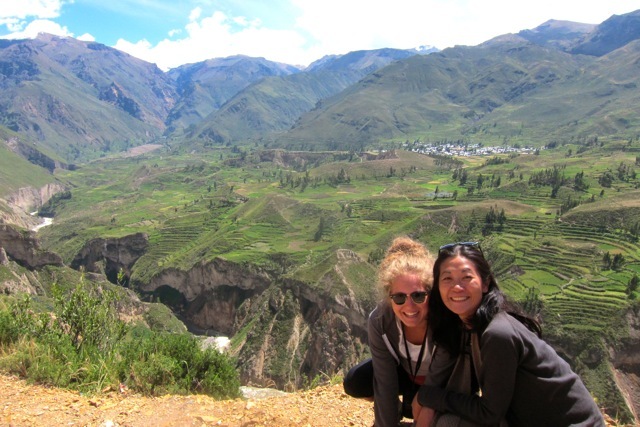 I must have felt so energized and invincible that when Morin suggested doing the Colca Canyon Trek, I had very little qualm. I have no idea why the mention of 7-8 hour trek on the first day didn’t trigger a warning bell. And so we booked. 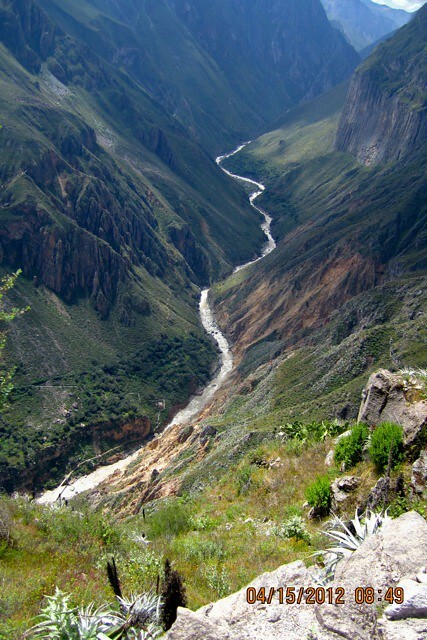 Colca Canyon is a canyon in the Colca River in southern Peru. 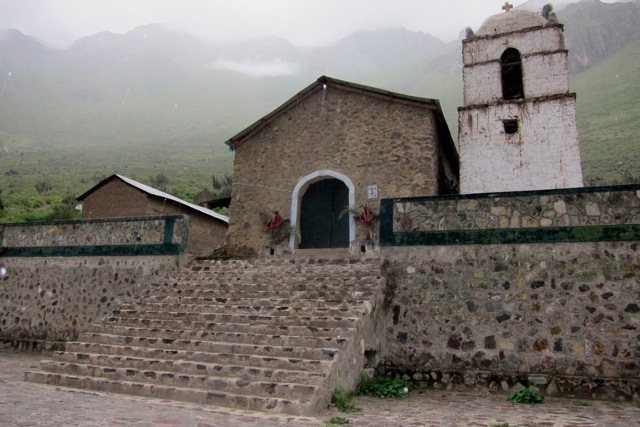 It is located about 160 kilometers northwest of Arequipa. It is more than twice as deep as the Grand Canyon in the United States 4,160 m. The Colca Valley, our destination, is an Andean valley with towns founded in Spanish Colonial times and formerly inhabited by the Collaguas and the Cabanas. The local people still maintain ancestral traditions and continue to cultivate the pre-Inca stepped terraces. 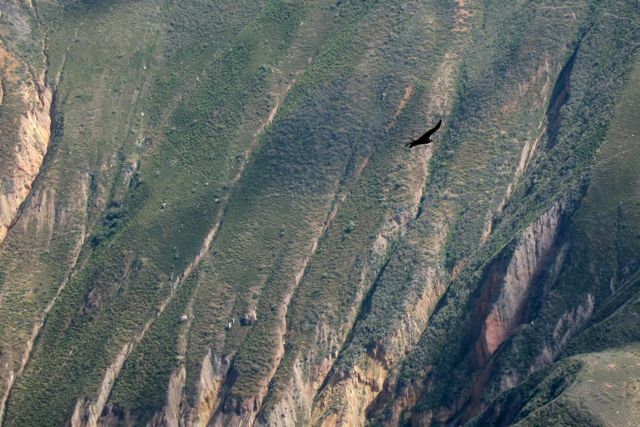 Beside its magnificent view, the main attraction of Colca Canyon is that it is home to the Andean Condor, an endangered bird species that merited a world-wide effort to preserve it. And we caught sight of these birds early on our Colca Canyon trek. Colca Canyon trek day started horrifyingly at 3:00 a.m. where we were picked up and hauled into a tight van. Everyone were so sleepy anyway and I luckily got the seat at the back where the aisle ends, meaning leg space. I tried to sleep. It will be 6 hours drive to Cabana Conde in Colca Canyon with stop over for breakfast at Chivay and the La Cruz del Condor. As I normally couldn’t sleep while on sitting position, it might as well be, because the ride was absolutely gorgeous. I wish I could take photo but I was sandwiched in the middle. I saw my seat mate tried and failed, so I content myself with admiring the view. La Cruz del Condor is a popular tourist stop to view the condors. The best times to see the condors is during the early morning and late afternoon when they are hunting. At this point the canyon floor is 3,960 ft (1,200 m) below the rim of the canyon. The site is amazing. After another 20 minutes of car ride, we arrived where our Colca Canyon trek down hill starts. Down hill might sound easy as you thought you just go down. That is true except that while your lungs rest, your knees take the toll. We broke into 6 person group + the guide. A few meters into the hike, I knew it was a bad idea to come. It was steep, hot, hard, high, narrow, slippery, everything I’m scared of! Ok, so maybe it’s not the hardest trek in the world. It certainly looked easy for the rest of the group, except for Chantal, who did pretty well although not too thrilled. But it’s definitely hard for me which made me do a quick evaluation of my sanity. Why didn’t I check what was the trek like? It was cold when we started and then quickly became hot. I didn’t carry much, just a sweater, a change of shirt, toothbrush, and water, but they soon felt like weighing a ton. The path was dry with those tiny pebbles that made it slippery and I slipped quite a number of times. At first I blamed it on my worn out trainers, which after 1 year of walking on them, were kind of thread bare. But then I looked at my guide’s battered shoes, and she does this trek 3x a week. I was so slow because I kept slipping and was so scared to fall into the cliff. The amazing view did nothing to encourage me. I really just wanted it to be over but the road stretched forever! The next 4 hours or so, we descended from 3,300 m. to 2,100 m. to a small village where we had our lunch and short rest. It was also a chance to bond with our trek buddies and make fun of me. 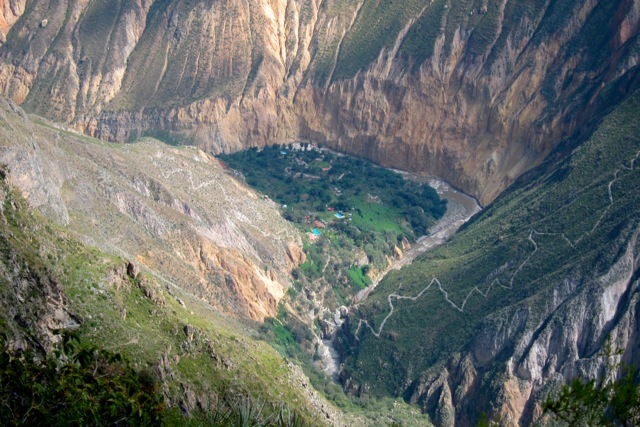 Then too soon, my agony started again as we continue on the trek down the Colca Canyon. It will be another 3-4 hours to our destination, Sangalle, a village deep in the canyon where we’ll spend the night at bamboo resort hotel with swimming pool, gardens, fountain, and hot water. However, we were not able to enjoy the resort because it started raining, and we just wanted to be dry. There’s no electricity in this place and it got dark very early. It’s a challenge just getting from the room to the dining to the toilet. Honestly, I don’t know why it’s called a resort. It’s a shack. Colca Canyon trek day 2 began at 5:00 a.m. Without breakfast, we started climbing uphill in the dark. It’s going to be 3-4 hours with a little bit of pressure because we will have to be there at 9:00 a.m. to catch our van and breakfast. What occupied my mind that helped me get through were the following: (1) This is better than a death march. (2) Hunger Game – borrowing Katniss Evergreen’s determination to survive. (3) Left. Right. Left. Right. One foot ahead of the the other. Left. Right. Left. Right. Almost like a death march. (4) Imagine myself running away from a serial killer or communist or godzilla. (5) To finish with as much dignity as I can, meaning no donkey! Because there is actually a way out. 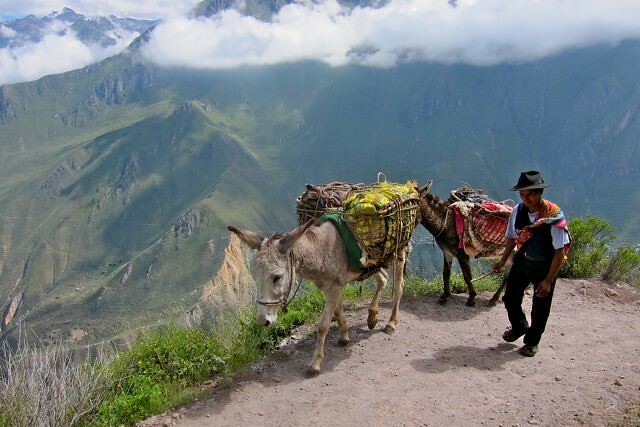 It is possible to hire a donkey at 60 soles (25$). I thought the road will never end but of course it did. I didn’t die thank goodness, because I’m yet to do Machu Picchu and the Galapagos. After climbing out of the canyon, there’s another 45 minutes walk on flat land for breakfast. It’s amazing how you can keep going even if you swear you couldn’t anymore. We had breakfast, waited for the van, took another 2-3 hours ride to be back in Chivay for the hot spring “La Calera”. It was really nice ending to the trek, if only to be able to take a shower. It felt good to soak my numb and battered legs into 38°C water, even if it was sunny. Lunch and another long ride until we are back in Arequipa. The reward of this trip are the people I was with. On the first day, in the beginning Morin and Chantal kept me company because the guide went ahead. But later the guide walked with me encouraging me all the way. Emmanuel from Canada offered to take my water, which was a nice gesture, but when he saw I had a 2L bottle decided he had no room in his backpack. Then super nice Christian from Switzerland, said to put it in his (backpack). Chantal later pointed out the difference between European and North American men. European men are generally more sweet and nicer to women even if they have no intent of sleeping with you. And of course the next day, as if to prove a point, when I was almost completely destroyed, but yet had to climb out of the canyon, tripping already at the beginning of the trek, Christian took my backpack and carried it the whole way up. I am so thankful and so touched with his super niceness. good on you for not getting tempted by the devil donkey!